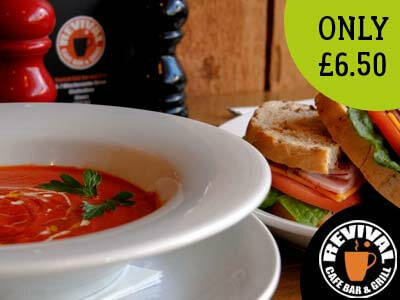 We serve cooked breakfasts and lunches, sandwiches, cakes, organic tea and coffee, fresh smoothies and milkshakes! Our open canopy seating is a great place to unwind with our devine wines, tasty beers and fruity cocktails. Our delicious menu has a variety of dishes served fresh from the grill! Reserve a table with us for parties and events. 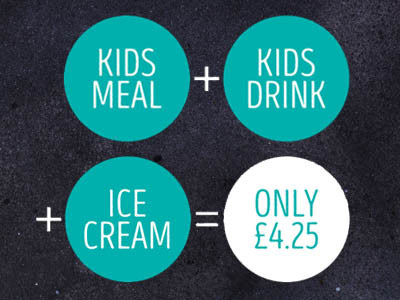 Kids meal, drink and ice cream only £4.25! Free side salad included on request. At Revival Cafe, Bar & Grill we pride ourselves on our unique menu designed by our talented chefs. 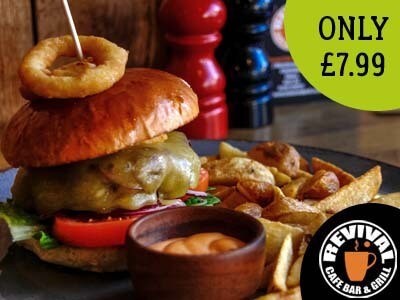 All our food is freshly prepared with tasty ingredients and local butcher meats. Visit us in Cheltenham town centre for fresh, homemade meals including cooked breakfasts, hot and cold lunches, afternoon tea and tasty cakes. Enjoy a glass of wine in our open canopy seating in the summer, or join us for a hearty, home-made meal at any time of the year! There is a large seating area downstairs with more seating upstairs too. At Revival we can cater for large parties and create custom orders for your guests. Call today to book a table for a work meal, a birthday celebration, a wedding – or any type of occasion! We pride ourselves on stocking organic, fair trade tea and coffee which our customers love! Why not visit us for afternoon tea and enjoy one of our homemade cakes too. View the menu for more details.